DETROIT, Dec. 8, 2014 ― While China continues to dominate as the world’s largest automotive market, a PwC AutoFacts survey shows the country still lags far behind in new vehicle financing, although signs are emerging that the trend is changing. Currently, 76 percent of car buyers purchase vehicles with cash, forcing the auto financing industry into a niche role in this vast marketplace. But with the help of the millennial generation and the Chinese government, this trend is expected to shift in coming years. It’s estimated that over the next five years, leasing could grow at an annual rate of 25 percent, potentially creating significant growth opportunities for OEMs’ captive finance arms and investors in auto asset-backed securities alike. China’s status as the leader in new vehicle sales are not expected to change anytime soon and has continued to grow with a 17 percent compounded annual growth rate (CAGR) between 2003 and 2014. However, the country’s decade-old auto financing market is still not recognized as an accepted method for purchasing a new vehicle among Chinese consumers with only 21 percent using credit to finance their vehicle purchases. In mature markets such as the U.S., France and Germany, between 50 and 85 percent of sales are financed. Leasing as an option is even more scarce in China, where consumers prefer outright ownership, in contrast to countries such as Germany where leasing makes up 35 percent of new vehicle sales. But with the emergence of the millennial generation, which is more open to convenient, affordable and relatively low-risk financing offerings, this landscape is changing. In addition to being more willing to experiment with vehicle purchase options, the millennial generation has enjoyed a sustained period of economic prosperity for much of their lifetimes, loosening their attitudes toward financing. Also, with a growingeconomy, the other trend developing among Chinese consumers is the increasing preference for bigger, premium vehicles. Luxury and SUV sales are up, which means higher average transactions, making financing a more reasonable option. Additionally, the Chinese government is doing its part to spur lending by promoting awareness of financial leasing options. More important,, it is also considering relaxing regulatory requirements to obtain auto financing licenses through the China Banking Regulatory Commission. The softening environment will likely result in growth opportunities for and an increase in OEM captive finance arms and more auto financing beyond traditional loans, as evidenced by the expected 25 percent growth rate in leasing. All this bodes well for OEMs as the model of financing acting as the catalyst for customer touch points and revenue opportunities through aftermarket sales, warranties and service across ownership cycle, begins to develop in China. 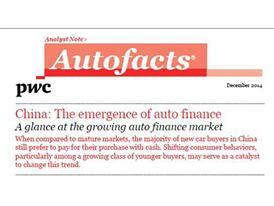 For more information about PwC’s Autofacts Analyst Note, download the December issue at www.autofacts.com​ or download the Autofacts app. PwC's global automotive practice leverages its extensive experience in the industry to help companies solve complex business challenges with efficiency and quality. One of PwC's global automotive practice's key competitive advantages is Autofacts®, a team of automotive industry specialists dedicated to ongoing analysis of sector trends. Autofacts provides our team of more than 4,800 automotive professionals and our clients with data and analysis to assess implications make recommendations, and support decisions to compete in the global marketplace. PwC firms help organizations and individuals create the value they’re looking for. We’re a network of firms in 157 countries with more than 184,000 people who are committed to delivering quality in assurance, tax and advisory services. Tell us what matters to you and find out more by visiting us at www.pwc.com​. Learn more about PwC by following us online: @PwC_LLP, YouTube, LinkedIn, Facebook and Google +. © 2014 PwC. All rights reserved. PwC refers to the PwC network and/or one or more of its member firms, each of which is a separate legal entity. Please see www.pwc.com/structure​ for further details.